*If you want the frosting to be sweeter, you can add more sugar. Preheat the oven to 350 degrees F. Butter two 9 inch round cake pans, dust the insides with flour, and tap out the excess. Line the bottoms of the pans with parchment paper. Working with a stand mixer, fitted with a paddle attachment,beat the butter on medium speed until soft and creamy. Add the sugar and beat for another 4 minutes. Add the eggs one by one, and then the yolk, beating for 1 minute after each addition. Beat in the vanilla; don’t be concerned if the mixture looks curdled. Reduce the mixer speed to low and add the dry ingredients alternately with the buttermilk, adding the dry ingredients in 3 additions and the milk in 2 (begin and end with the dry ingredients); mix only until the ingredients disappear into the batter. Divide the batter evenly between the two pans. Bake for 28 to 30 minutes. When fully baked, the cakes will be golden and a thin knife inserted into the centers will come out clean. Transfer the cakes to a rack and cool for about 5 minutes, unmold them, and peel off the paper liners. Invert and cool to room temperature right-side up. Put sliced strawberries in a shallow container and pour the wine over it. Cover and let it rest in the fridge for about an hour. Using both a chilled bowl and chilled beaters, beat the cream until frothy. Add the powdered sugar and wine gradually while beating. Whip until the cream holds soft peaks. *If you see the frosting gets too thin, don’t add more wine. *If the frosting looks as if it might be a little too soft to spread over the cake, press a piece of plastic wrap against its surface and refrigerate it for 15 minutes. You can refrigerate the cake too. It’s very important that if the tops of the cake layers have crowned, you should use a serrated knife to even them. Place one layer right-sight up on a cake plate. Using a brush or a spoon, soak the layer with some La Fantasia wine. Spread some of the whipped cream frosting and add some of the strawberry filling. 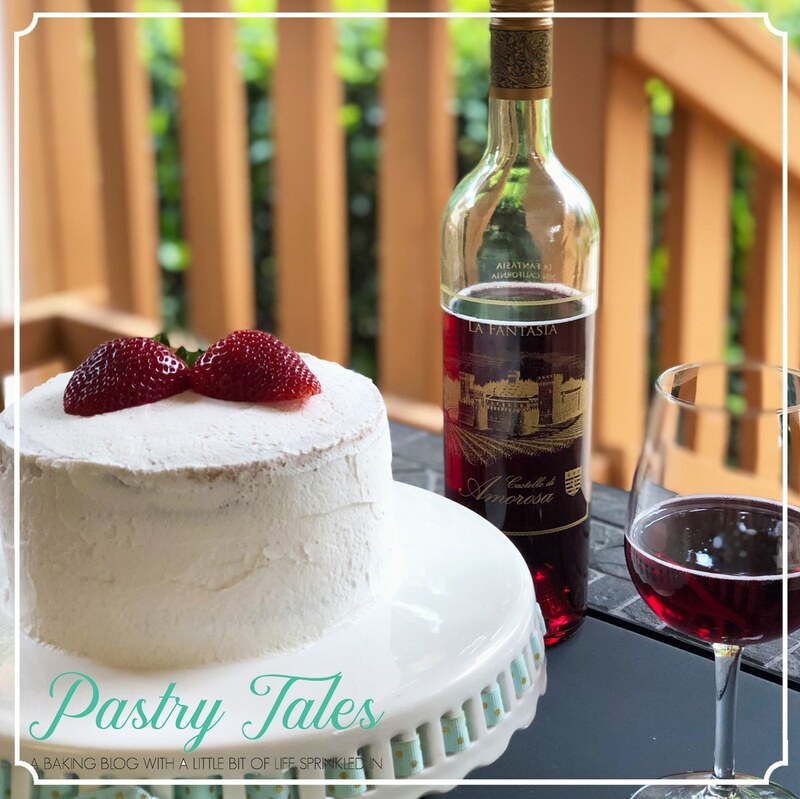 Put the second cake layer on the counter and brush the top of it with some La Fantasia wine, then turn the layer over and position it, soaked side down, over the filling. Frost all the cake with the remaining whipped cream. You can decorate the top with fresh strawberries or you can use the leftover filling. Refrigerate it for an hour and then serve.